Stereotactic Body Radiation Therapy (SBRT) remains an emerging treatment option for men with prostate adenocarcinoma. Retrospective analyses utilizing Medicare claims data provided caution regarding potentially higher rates of cystitits and urethrtitis. There exists considerable variability in bladder volume dosimetric objectives between institutions and collaborative groups. 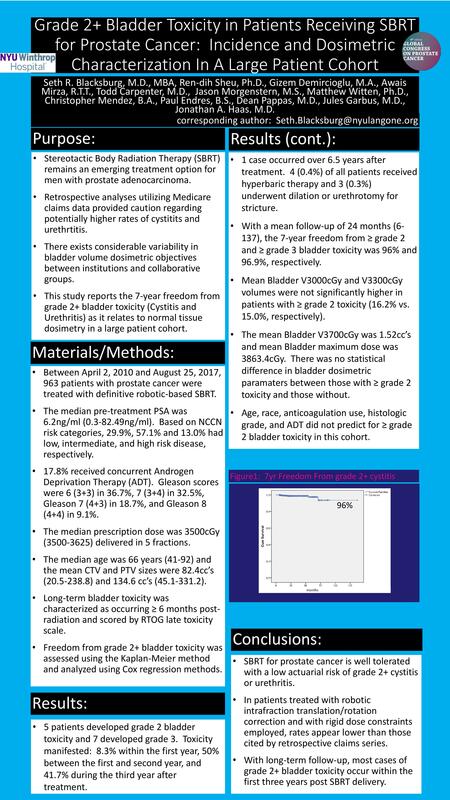 This study reports the 7-year freedom from grade 2+ bladder toxicity (Cystitis and Urethritis) as it relates to normal tissue dosimetry in a large patient cohort. Between April 2, 2010 and August 25, 2017, 963 patients with prostate cancer were treated with definitive robotic-based SBRT. The median pre-treatment PSA was 6.2ng/ml (0.3-82.49ng/ml). Based on NCCN risk categories, 29.9%, 57.1% and 13.0% had low, intermediate, and high risk disease, respectively. 17.8% received concurrent Androgen Deprivation Therapy (ADT). Gleason scores were 6 (3+3) in 36.7%, 7 (3+4) in 32.5%, Gleason 7 (4+3) in 18.7%, and Gleason 8 (4+4) in 9.1%. The median prescription dose was 3500cGy (3500-3625) delivered in 5 fractions. The median age was 66 years (41-92) and the mean CTV and PTV sizes were 82.4cc’s (20.5-238.8) and 134.6 cc’s (45.1-331.2). Long-term bladder toxicity was characterized as occurring ≥ 6 months post-radiation and scored by RTOG late toxicity scale. Freedom from grade 2+ bladder toxicity was assessed using the Kaplan-Meier method and analyzed using Cox regression methods. 5 patients developed grade 2 bladder toxicity and 7 developed grade 3. Toxicity manifested: 8.3% within the first year, 50% between the first and second year, and 41.7% during the third year after treatment. 1 case occurred over 6.5 years after treatment. 4 (0.4%) of all patients received hyperbaric therapy and 3 (0.3%) underwent dilation or urethrotomy for stricture. With a mean follow-up of 24 months (6-137), the 7-year freedom from ≥ grade 2 and ≥ grade 3 bladder toxicity was 96% and 96.9%, respectively. Mean Bladder V3000cGy and V3300cGy volumes were not significantly higher in patients with ≥ grade 2 toxicity (16.2% vs. 15.0%, respectively). The mean Bladder V3700cGy was 1.52cc’s and mean Bladder maximum dose was 3863.4cGy. There was no statistical difference in bladder dosimetric paramaters between those with ≥ grade 2 toxicity and those without. Age, race, anticoagulation use, histologic grade, and ADT did not predict for ≥ grade 2 bladder toxicity in this cohort. SBRT for prostate cancer is well tolerated with a low actuarial risk of grade 2+ cystitis or urethritis. In patients treated with robotic intrafraction translation/rotation correction and with rigid dose constraints employed, rates appear lower than those cited by retrospective claims series. With long-term follow-up, most cases of grade 2+ bladder toxicity occur within the first three years post SBRT delivery.